A new integration method (based on JIRA’s WebHooks) has been added. This brings us the support for JIRA OnDemand. 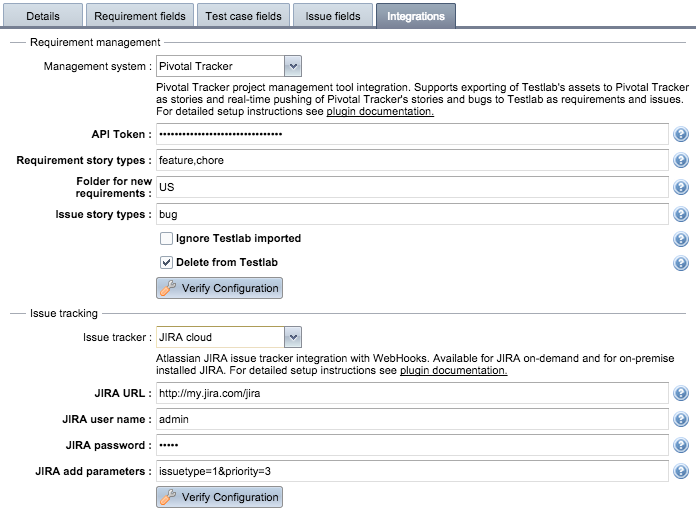 New JIRA integration method supports pushing JIRA’s issues as requirements / user stories to Testlab. This makes it possible to push stories from your JIRA Agile to Testlab for verification. A brand new support has been added for Pivotal Tracker agile project management tool. You can now easily manage and track your project tasks in Pivotal Tracker and in the same time, test, verify and report your implementation in Testlab. Read further for more details on these new exciting features. To this day, Testlab has supported JIRA integration with best in class 2-way strategy with a possibility to freely edit issues in both end systems. For this to work the JIRA has had to be installed with Testlab’s JIRA plugin, which provides the needed synchronization techniques. Atlassian’s cloud based offering, JIRA OnDemand, won’t allow us to install custom plugins which leads us to the situation that the 2-way synchronized integration possibility has been possible only with JIRA instances installed on customer’s own servers. The new JIRA integration strategy has been implemented in a way, that it is possible to configure it in use by just using JIRA’s WebHooks. This requires no plugins and brings us the support for JIRA OnDemand instances. Keep in mind, that the new simpler integration strategy is also available for JIRA instances installed on your own servers. The new integration method works in a way that issues and stories are created in JIRA and can be pushed to Testlab. This is possible for issues / bugs and also for requirements. For example, you can push stories from your JIRA Agile to Testlab as requirements which makes it possible to integrate the specification you end up designing in your JIRA as part of specification in your Testlab project which you aim to test. You can read more about the different integration strategies for Atlassian JIRA here. All new integrations, including the JIRA integration for issues and requirements and the Pivotal Tracker integration, are implemented in a way in which they can be taken in use by yourself. The project management view in Testlab has a new Integrations tab which allows you to configure the (Testlab side configuration) for these integrations. Integrations may also include some preliminary set up for them to work and instructions for these are provided in the plugin specific documentation. Pivotal Tracker is an agile project management tool for software team project management and collaboration. The tool allows you to plan and track your project using stories. Your Testlab project can be integrated with Pivotal Tracker to export assets from Testlab to Pivotal Tracker as stories and, to push stories from Pivotal Tracker to Testlab’s project as requirements. The integration works in a two way manner. 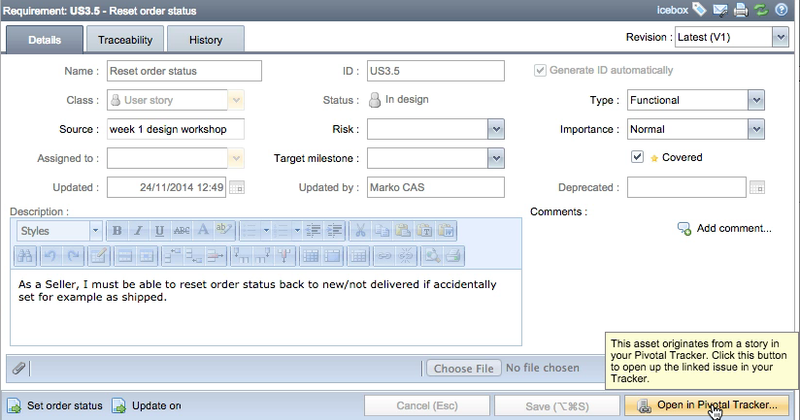 First, you have an option to import assets from your Testlab project to your Pivotal Project as stories to be tracked. You have an option to pull requirements, test runs, test sets, milestones, issues and even test cases from your Testlab project. When done so, a new story is created to your Pivotal Tracker project. It is as easy as dragging an asset to your project’s Icebox in Pivotal. push bugs from your Tracker to Testlab project as issues. Using Pivotal Tracker with Testlab is an excellent choice for project management. This way you can plan and track your project activities in Pivotal Tracker and in the same time, test, verify and report your implementation in Testlab. You can read more about setting up the Pivotal Tracker integration here. add support for JIRA OnDemand. We hope these new features make the use of Testlab more productive for all our existing and future clients.